To call a spade a spade, the president of the 8th Senate, Dr. Abubakar Bukola Saraki (The Waziri of Ilorin Emirate and Turaki Raya Kasar of Nupe Kingdom) is not only a man of timber and caliber but a savvy politician whose administrative clout remains inscrutable. The eldest son of the late Abubakar Olusola Saraki’s family is no doubt an enviable politician and this accounts for why his antagonists continue to astronomically increase in number each time he clinches more political achievements. There is no gainsaying the fact that the Senate President was able to stabilize Saraki’s family after his father’s demise and also survived the political legacies bequeathed to him by his dad ignited wrath against him from his dad’s rivals. The fundamental question is: who has bestowed this gigantic favour upon the Saraki’s family? If we all agree that it is Almighty Allah, the detractors should stop wasting their time denting BukolaSaraki’s reputation in order to politically get peoples’ support which they don’t and can never deserve. “Allah gives power to whosoever he likes”, so does the Holy Qur’an say. The qualities such as true democratic principles, respect for human dignity, justice and equity, egalitarianism, non-sentimental opinions and bravery for humanitarian well-being, and a host of others possessed by Dr. BukolaSaraki had been vindicating him in the previous elections (that is, 2003, 2007, 2011 and most significantly in 2015 where APC won all the elective offices, that is, delivering elections 100 percent for APC in Kwara State before election of the most coveted seat in the Red Chamber (that is, President of the Senate)) now exposed the kind of person he is to the whole world, barring all the fabricated and baseless castigations, onslaughts and reputation-soiling expressions from his rivals both within and outside Kwara State. The 2015 election which many Kwarans and national political analysts opined a litmus test of Dr. Bukola Saraki’s political leadership and sustainability of Saraki’s Dynasty after the death of his father, Senator Sola Saraki, was an unbeatable record for him as APC cleared all seats in the State despite the much winning interest former President Jonathan claimed to have in Kwara owing to Saraki, Governor Ahmed and Baraje’s opposition to him through the championing of NewPDP chaired by Alhaji Kawu Baraje who also hailed from Kwara. This landslide in Kwara and North Central where he was made the zonal party leader as APC cleared all the gubernatorial seats in the April 11 Election are the inerasable marks of his loyalty and contributions to APC. I don’t know where some dogs calling cat animal see the PDP blood flowing in him. Was it not the same PDP bloods he fused with others which resulted in the creation of new-PDP and later defection into APC which aided the victory of President Mohammadu Buhari? It is only in Nigeria that I see us resorting to names-calling and bulk-passing whenever the center could no longer hold. Somebody should tell these political in-fighters in APC to let Nigeria work as we cannot be politicking perpetually for four years. Alas! They are not mindful of the fact that six months, which are one-eighth of four years is passed already. Time waits for nobody jooor! Many happy-go-lucky people criticized him that he did not respect the party (All Progressives Congress) while seeking for the position of president of the senate, but every rational thinker who deeply comprehends the principles of democracy would digest and swallow the verisimilitude that he had truly demonstrated an attitude which is streamlined with Change which we seek in the way we do things in Nigeria. A sane Nigerian should see nothing wrong in his emergence against his party since it was constitutional. 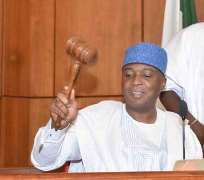 The ineffectiveness of the previous Senate in Nigeria was as a result of undue external interference from the political big wigs and the emergence of Saraki has given the senate a new history and also helped it to regain its long-lost autonomy glory. Saraki was born with silver spoon in his mouth but he doesn’t keep mute while some greedy Nigerians want to bend the rules to suit their purpose, no wonder the former president, Goodluck Jonathan and his stalwarts hated him for not aligning with them in their perpetrated hidden agenda which Saraki considered not to be in the interest of the masses. It is worthy to note that Saraki remained one of the active Senators in the 7th Senate and the whistleblower of many corrupt practices of President Jonathan’s administration such as Fuel Subsidy Scam, the oil cabalism, government-companies conspiracy of environmental pollution (e.g. Ogoniland oil spill by SPDC) and so on. It is a basic fact that besides the aforementioned, Saraki had led many crusades which culminated in huge political and economic developments for the country among which is President Muhammad Buhari’s victory both at the APC Presidential Primary Election and at the Presidential Election conducted in March, 2015. Before and after his emergence as president of the 8th Senate, series of unfounded lies were fabricated against him. Some caricature writers hired by Bukola’s rivals engaged in chanting ravings which they considered instrumental enough to make Nigerians develop strong aversion for Saraki. A cloying and big nonsensical fallacy was spread by prints media houses owned by his political opponents and a politically sponsored online media platform called Sahara Reporters. However when those slander in all facets failed, they resorted to hound him using legal means which were plagued by procedural errors. No wonder they can never succeed with the political persecutions ranging from Senate rule forgery, wife’s invitation by EFCC and lastly CCB/CCT trial! The composition of 8th Senate is very robust and sensitive. With high-profile and creme de la creme senators who did not follow Saraki because of money, rather because of the past leadership and human testimony and national interest. Senators Ali Ndume, Ahmed Yerima, Danjuma Goje, David Mark, Godswill Akpabio, Binta Garba, Ike Ekweremadu, Dino Melaye, Jonah Jang, Andy Uba, Kabiru Gaya and the likes who pitched their tent with Dr. Bukola did so because of his political qualities and antecedents which did not only admired but also endeared them. To all of these people, Saraki is a tested and trusted somebody whom they had in one way or the other operated with in various national assignments. The trust they have for him evidently resulted in the vote of confidence passed on his leadership twice by them. In the last note, it is quite fathomable that they (Senators of 8th Senate) did not want the toothless bulldog Senate President who would subject the house to unnecessary and undue control by the political god-father (s) outside the shore of the house, not because Saraki gave them money. Also, it must be stressed that some senators of the Unity Forum wanted to support Saraki because of his political charisma to perfectly pilot the affairs of the Red Chamber and now, they have started supporting him confidentially because of the manner in which he has been providing good leadership. They cannot explicitly demonstrate their loyalty to Saraki so as not to incite the wrath of their leaders. It’s widely unarguable that Saraki is an independent Senate President and that has hugely helped in his discharge of duties with regard to legislations to better the lives of common men, even at the face of his politically fuelled trial. Without an incongruity, Dr. Bukola Saraki’s democratic and constitutional emergence as Senate President on June 9, 2015 has changed the face of Nigeria Politics and has made him my man of the year. He is obviously an epitome of balance, an icon of justice and equity and a symbol of service to humanity who remained focus and unshakable in the discharge of his administrative and political duties in his trying moments in the year 2015. God bless Nigeria as i wish Nigerians the very best under President Muhammadu Buhari and Senator Bukola Saraki in the coming years. Disclaimer: "The views/contents expressed in this article are the sole responsibility of Bahir Akanbi and do not necessarily reflect those of The Nigerian Voice. The Nigerian Voice will not be responsible or liable for any inaccurate or incorrect statements contained in this article."